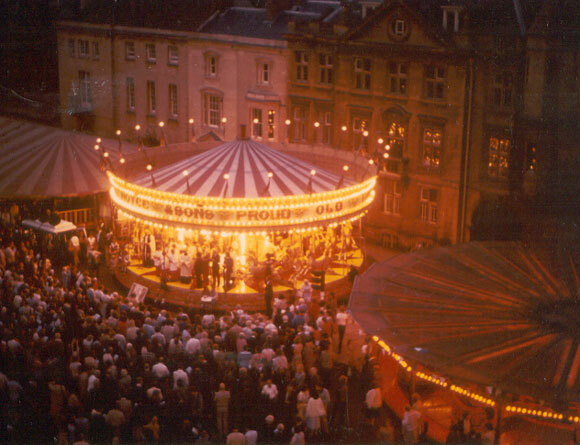 St.Giles Fair, Oxford, 2004. A fair has been held in this location since the 17th Century. In the late 1970s, when I was a student of architecture, I took part in a school trip to Paris. The staff had arranged visits to what they considered important buildings: Villa Savoye (we were impressed), the new Ricardo Bofill’s apartment blocks at Noisy-le-Grand (bizarre to us but soon to be the location for Terry Gilliam’s fun sci-fi film Brazil, after which it all seemed to make sense), and La Défense (before its most famous addition La Grande Arche). There were many other visits, which I can no longer recall; after all they were busy days experiencing fascinating, if not always memorable, architecture. In the evenings we were left to our own devices, making our way between cheap bars back to cheaper hotels in the centre of the city. On one of these evenings my friends and I were wandering through the dark, wet and empty October streets in the general direction of our hotel, when we came across a sight that has stuck with me vividly these past forty years, and has helped shape my career in architecture. Turning down a narrow alley we became aware of music and light appearing in a gap between the mostly closed and shuttered buildings. As we got closer the tinny sound of French pop music, combined with a mechanical rattling, became louder. We emerged into a junction of four or five narrow streets defining an informal square bounded by tall houses with the usual Parisian mix of bars, bistros and local shops at ground level. In the square was a small fairground of traditional rides still touting for business on this cold rainy night, although it was late and there were not many people around. Though there were only three or four rides, their bustling presence seemed enough to entirely fill the compact square. The roundabout was still twirling around, its painted horses rising and falling with just one or two riders, and although the other rides were static they were still illuminated with flashing and twinkling lights, their roustabouts waiting for the last few punters before closing for the night. The loud Europop bounced off the buildings, raucous and out of place with the nineteenth century ambience of the scene, but adding power to the almost surreal experience we all felt. Music, lights, and movement were set against the dark silhouette of the static, yet characterful buildings. In the dark, damp city the appearance of the fair seemed both incongruous and joyful, exotic and full of life, it represented colour, entertainment and pleasure, right on the local residents’ doorstep. We lingered for a while though no one took a photograph or hitched a ride on the horses or the waltzer – then we left for our beds after a long day. Having initially found it completely by accident, the next evening we were drawn back to the square, to find the wet pavements empty save for a few parked cars – the fair had moved on leaving the neighbourhood to its usual quiet existence – even the bars were closed this time. This was perhaps the first time that I recognised the enormous power that resides in the ephemeral event. An altogether normal place in the city had become somewhere very special for a brief moment in time – special enough that it has remained firmly in my memory for all these years. Though for us its presence was a happy accident, the small urban fair in that square in Paris needed a bureaucrat’s approval to take place, it’s operators to deliver and manage it, the tolerance of locals to let it happen, and it needed people to visit and pay for the rides. It was created in the tradition of travelling fairs that have moved around Europe for centuries, and continue to do so. The urban arts and music festivals that take place in our cities today relate in concept and effect to these fairs, sometimes with even more resonance for local populations if they adopt important public spaces, and their content relates to regional identities. Their ability to change these spaces temporarily, and to create permanent memories of this change has, like the tradition of the fairs of the past, recognisable value in terms of place making. They might be described as ‘ephemeral cities’ that exist alongside the permanent backdrop that we see every day, and remain in our memories for as long as the permanent ones. They are a key element in making us feel that our urban space belongs to us, is managed for us, and is responsive to our imagination and needs. They make the city a fun place to be, a place of surprise, and a place endowed with powerful, positive memories. « What Makes a Music City?